Ed Koch, who died this week, was the mayor of NYC while I lived there, from the fall of 1976 to January of 1980. He was never my favorite politician, but he must have been fun to cover. Here is a collection of tales form the City Hall pressroom. 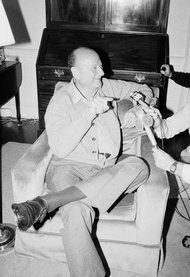 Ed Koch talking to reporters at Gracie Mansion, the city’s official mayoral residence.